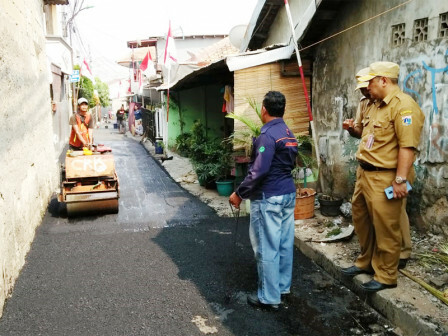 " It is targeted to be finished in the forthcoming September"
Jalan Bona Kampung Pisangan, RT 07/03 Penggilingan, Cakung, East Jakarta, began today, Monday (8/27). This road is part of seven damaged road repair points in Penggilingan Urban Village. Based on the information in the field, a number of workers are seen to repair roads that have 2-2.5 meters wide. East Jakarta Bina Marga Sub-dept. Head, Juaini Yusuf stated that it is carried out in conjunction with other points in RW 08, 03, 14, 12, 01, 02, 04 and 05. "In Penggilingan, there are eight points that will be repaired. Total wide of the road is 17,786 square meters," he expressed. Of eight points, repair that has been completed is located in RW 01, 02, and 12. And RW 03 and 14 are still on process. "It is targeted to be finished in the forthcoming September," he said.